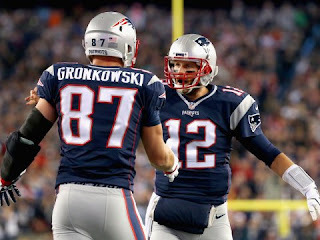 Efficiency is key, and Tom Brady and Rob Gronkowski are exactly that. 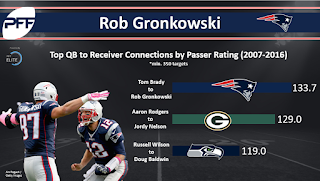 According to Pro Football Focus, the dominant Patriots pairing has the top quarterback-to-receiver connection by passer rating since 2007 (133.7). Aaron Rodgers and Jordy Nelson come in at second with 129.0, while Russell Wilson and Doug Baldwin are third with 119.0. -Since the NFL merger in 1970, there are 203 cases where a player registered 400 receptions over their career. Out of those players, Gronk leads all tight ends in receiving yards per game (69.3) and receiving touchdowns per game (0.77). Out of all players, the New England Patriots tight end ranks best in receiving touchdowns and 19th in receiving yards per game. -Of the 28 players on the list to play in the NFL since targets became a statistic in 1992, Gronk leads all players in yards per target average (9.88) and touchdown percentage (11.0 percent). 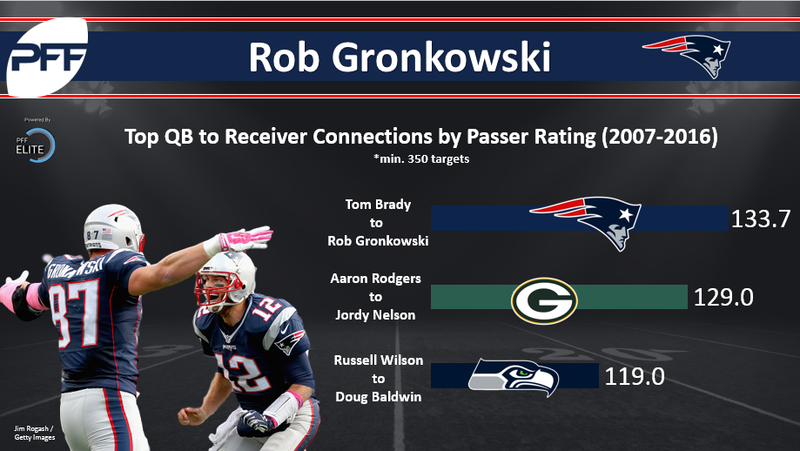 -Gronkowski is the only player, in the past ten years, to rank top-five among all players in touchdown percentage on end zone targets and targets inside the 10- and 20-yard lines. When he is healthy and able to play, Gronkowski also has a major impact on quarterback Tom Brady. In games that Gronk has participated, Brady has a 103.4 passer rating. When he isn’t there, Brady averages an 88.6 passer rating. With a crew of Rob Gronkowski, Julian Edelman, Brandin Cooks, Chris Hogan, Danny Amendola and Malcolm Mitchell, Brady will have one of his strongest groups of weapons yet.